John McCain is a Republican member of the United States Senate, from Arizona. (Wikipedia) He's a notorious supporter of virtually any military conflict the U.S. could get involved in. McCain has called for a U.S.-led air war to to topple the Syrian government, from as early as March 5, 2012 (ABC News). He's done what he can to arm Syrian rebels, from at least February, 2012 (New York Times). Into 2016 he has lambasted the Obama administration for not doing enough to help the Syrian people by escalating the war. Two of the men in the photo – Mohamed Nour, well-known as chief spokesman and photographer for the Northern Storm Brigade, and Abu Ibrahim – have been fingered by one of the abducted pilgrims, and the Lebanese media. This report says the Lebanese hostages were “transferred” to the custody of an Islamist group, perhaps the al Qaeda-affiliated Al Nusra Front. These are the “moderates” Sen. McCain wants to arm. CNN Political Ticker: :McCain's office was quick to reject speculation the Republican knowingly met with men accused of the abduction. 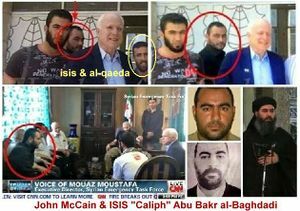 "If the individual photographed with Senator McCain is in fact Mohamed Nour, that is regrettable. Genuine interview to French TV from about the same time. This page was last edited on 23 February 2017, at 20:24.